Polar Bears - in a landscape as unforgiving as it is delicate and as beautiful as it is stark, the ultimate Arctic marine hunter finds its home. 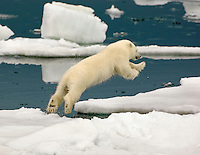 The polar bear has become a symbol of the Arctic and of life's struggle to sustain balance in a land of extremes. Visit these Lords of the Arctic.